Ninety-Eight years ago on May 28 Armenia became independent after living under occupation and oppression for centuries. Still reeling from and in the throes of the Armenian Genocide, the heroic battles of Sardarabad, Bash-Abaran and Gharakilise cemented the Armenian will for survival and perseverance that echoed their desire for self-determination and freedom. This year, Armenian Independence Day is being marked under a heavy cloud of war over Artsakh, which was savagely attacked last month by Azerbaijan, which has advocated violence and aggression since it lost the war for the liberation of the Nagorno-Karabakh Republic more than two decades ago. The significance of this year’s Independence Day celebration is that, once again, the Armenian nation faces threats to its existence and security. The overwhelming response from the Armenian Nation to what is now being referred to as the “four-day war of April,” has stark similarities to the call to arms that rang almost a century ago and which mobilized thousands of the Armenians to the service to their homeland from all corners of the world. The current geopolitical situation is also very similar to that of 98 years ago, with world powers vying for influence and control in the region, with the US and Russia locked into a contest for dominance that stems from energy interests among others and with Turkey playing its destabilizing and murderous role as the Ottoman Empire was in its waning years. Just as was the case almost a century ago, Armenia finds itself at the crossroads of those interests with its national security, once again, threatened. The difference, however, is that Armenia is not a nascent republic. For the past 25 years, Armenia has had the opportunity to establish itself as a player in the region. With Artsakh on its side, the two republics have a military that has been staving off attacks by the aggressor, Azerbaijan, and have been able to guard and protect our national borders from peril. The April attacks on Artsakh, however, seem to have signaled a change to the game with regional players sounding more anxious about a definitive solution to the Nagorno-Karabakh conflict, each pressing its own agenda. Meanwhile, official Ankara, with its despotic leader Recep Tayyip Erdogan, is pressing forward for its hunger for regional dominance and is stopping at nothing to guarantee that its brand of uncivil supremacy rules the region. It is within this context that lessons from 1918 must be applied to ensure that the Armenian Nation will persevere. This would require every Armenian, be they from Armenia, Karabakh, Javakhk, Western Armenia or the Diaspora, to consolidate their efforts on our national survival and to put aside petty—but often detrimental and self-serving—preferences for the advancement of Armenian Cause and recalibrate their focus on the one thing that matters the most—the Armenian Homeland. Each of us must become a soldier in the face of these challenges. Each of us must feel the burden and choose a role in this struggle, which if the external forces have their way, can turn into a modern-day liberation movement for Armenians. Willingness to fight for and sacrifice for the homeland became the driving force that brought us victories in 1918 and enabled us to overcome invading aggressors. The same determination guided our people to victory in Artsakh and must now lead us in our struggle to strengthen our homeland and advance the Armenian Nation. May 28 is not merely a day for celebration of our historic victories, but also a critical opportunity to wrest the control of our destiny of a truly FREE, UNITED AND INDEPENDENT HOMELAND. The arbitration process is legal and binding. Therefore, the Repbublic of Armenia should thru legal available channels pursue the restoration of her Western, Eastern, Northern and Southern borders. In the interim Armenia’s so called allies like Russia, must annul the Moscow Treaty and any other remnants of Bolshovik / Turkish Natuonalist (Attaturk) agreements. The US and other Western or Eastern civilizations should stop their hypocrisy and acknowledge the legitimate rights of the Armenian Nation. A great crime against Armenians (mankind) was committed and justice shall be restored. 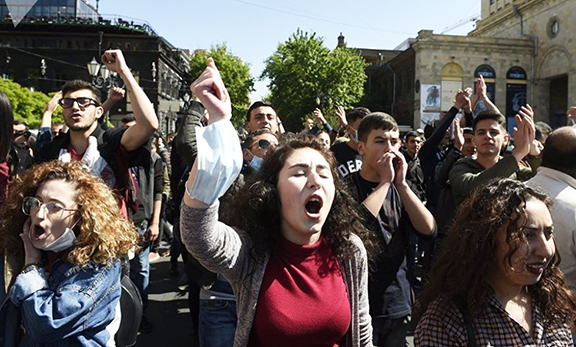 Return of Armenia’s lands to her people is one of the first steps in restoration of justice. Good article but it lacks in a very important thing: we are securing our borders with the help of our only important allie in the region: Russia. And not only now, it was the same in that times and will be in the future. When you say US and Rusia are fighting for energy you put them equally in the same place and thats false because Russia despite all the propaganda and lies we are hearing today is our allie and we don have oil nor gas! There are more importante reasons, geopolitical reasons, and US and his allies are supporting in a very strong war all our enemies: Turkey and Azerbaijan (it includes Israel, Saudi Arabia, EU, etc.). Germany for example can recognize the genocide but they are supporting Erdogan in the inmigrants isue with a lot of money, being again all of them US and EU accomplices of genocide in Irak and Siria, genocide they recognize in the Congress but they are still comiting! today itself!